Tacitus, who set these speeches down, drew upon his father-in-law, Agricola as the main source. However, this was some time after the events occurred, and as no records were kept of the actual final speeches, these are probably approximations of the true dialogues. Looking over the availabale areas for a suitable place that would aid his outnumbered soldiers, Suetonius found one that would put him at an advantage. Tacitus wrote : 'a position in a defile with a wood behind him.' This placed him at the top of an incline in keeping with the standard Roman battle tactics, This hill had a forest to one side and meant that he would have to face the enemy from only one direction. His choice was obvious since he is said to only have 10,000 infantry against the 200,000 rebels. The precise location has never been recorded, but it is believed to have been in the West Midlands. The rebels thought this ws going to be another slaughter of Romans, so they assembled as many spectators as possible. Mothers, fathers, grandparents, children, babies, livestock, etc., and wagons loaded with the material gains so far plundered were amasses behind the British. Everyone waited to see the spectacle and revel in their impending victory. The Celts were high on enthusiasm. The sound of drums, pipes and the people shouting carried far and wide. Many Celts were clothed in their tartan attire, many naked as was Celtic tradition in battle. Brandishing spears, swords, or stolen swords, their skin patterned with blue woad to frighten thei enemy. You can imagine the reaction of the highly trained Roman soldiers, outnumbered by far, perched at the top of their slope. They rallied around their commander, who spent issued his speech convincing them that the battle could be won. 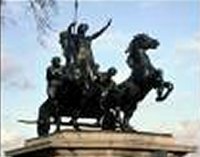 Boudicca gave a final speech, then the Celts charged towards the Romans. Boudicca's force assembled in a rather loose formation, behind them, their women and children further back in wagons. The Britons were still using chariots, which is in conflict with the Roman policy of disarming the natives of any country they conquered. It could be that they were supplied from tribes not yet under Roman control. The Romans unleashed their javelins down the slope onto the Britons, followed by the charge of the infantry, all moving as one unit. All this was standard battle tactics for the Romans. This broke up the British force and forced them back to the wagons. Trapped here the battle turned into a massacre. 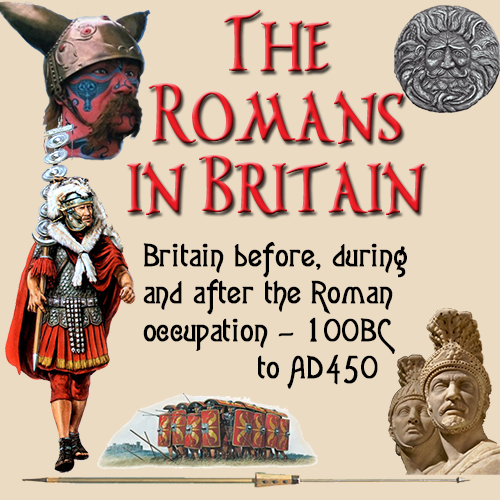 Anyone British, man, woman or child was cut down and killed by the Roman legion. Most of the advancing Britons were killed in the initial stages, and panic was spreading amongst the British because of the speed of the Roman advance The Roman cavalry joined the battle and came in from each side, encircling the British At the rear of the battlefield, the British families sat in their wagons watching the slaughter, knowing they were helpless. As the legionaires contnued the attack Boudicca's forces, they went into the camp where the families had made their vantage point and killed nearly every man, woman and child. Thought there were some survivors, most died. Many individual skirmishes continued well into the evening, until the light faded and darkness brought an end to the carnage. Some indeed say that there fell little less than eighty thousand of the Britons, with a loss to our soldiers of about four hundred, and only as many wounded. Boudicca was said to have survived the final battle and returned home to Iceni territory where she poisoned herself. It would have be out of character for Nero to have given her, or her daughters, any mercy. The fate of her daughters is not known. Whether they died with Boudicca or were killed by the Romans, or escaped is unclear. All we do know is that they disappeared from the scene, never to return. If Boudicca had survived and been captured, Suetonius would have taken her to Rome and displayed her in a triumphal parade in Rome, and subjected to absolute horrors of public torture before having her executed in the amphitheatre. Cassius Dio wrote that the British buried Boudicca in an expensive manner appropriate for a Celtic monarch, and halied her as a hero. Tacitus says nothing of her burial. There is a story that she was buried at Stonehenge and its legendary circle of stones were set up by the Druids to mark her tomb. However, there is not solid foundation for this and isthe story is largely taken to be a fable.